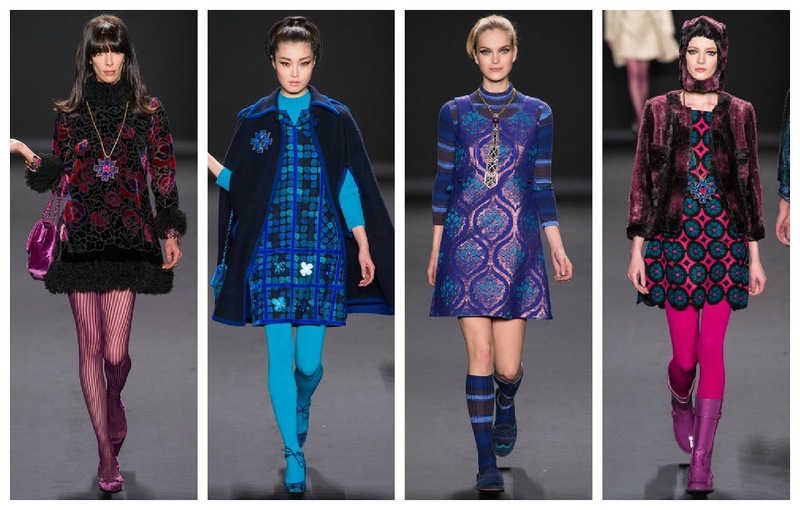 Anna Sui's Fall Winter 2013/2014 Collection is as usual inspired by the 1960s. Though that is a consitant time period inspiration for Anna, she always seems to come up with different looks and feels for each collection. This season is rather monochromatic with each look being being very matched. Where as in the past, wearing pieces that matched on purpose was thought to be unstylish, it's making a big come back. I never did understand why people made a strong effort to mismatch colors and pieces in outfits. 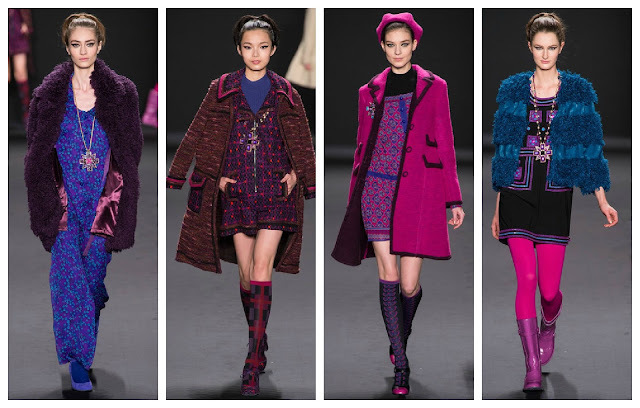 Though these looks are very monochromatic, they do have some contrast, which breaks up the colors. I'm a big fan of colorful and patterned tights, which fit in nicely with a 1960s theme, but also are a great way to take a plain outfit and add some interest to it. Of all these very mod outfits, I have a couple favorites. 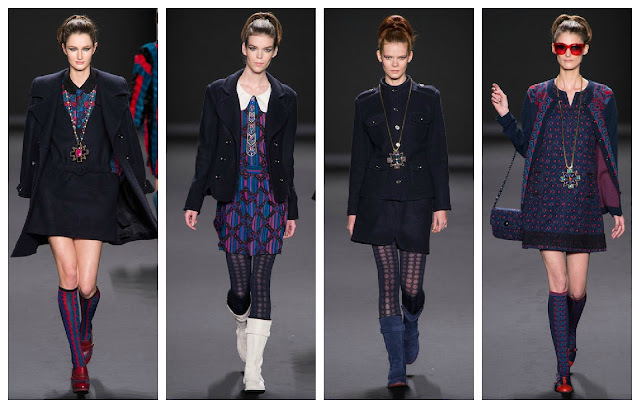 I like the 12th look, which features an A-line printed dress, a navy cardigan with a coordinating boarder pattern, and matching accessories. If you love matching things, this is a great example of it, as this whole outfit basically has the same print. 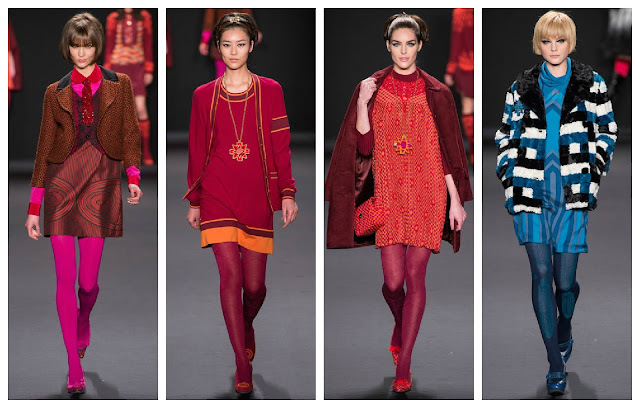 If you don't like such an obvious match, go with one bold piece...the cardigan or dress, and pair it with solid colors that pull from the print's colors. 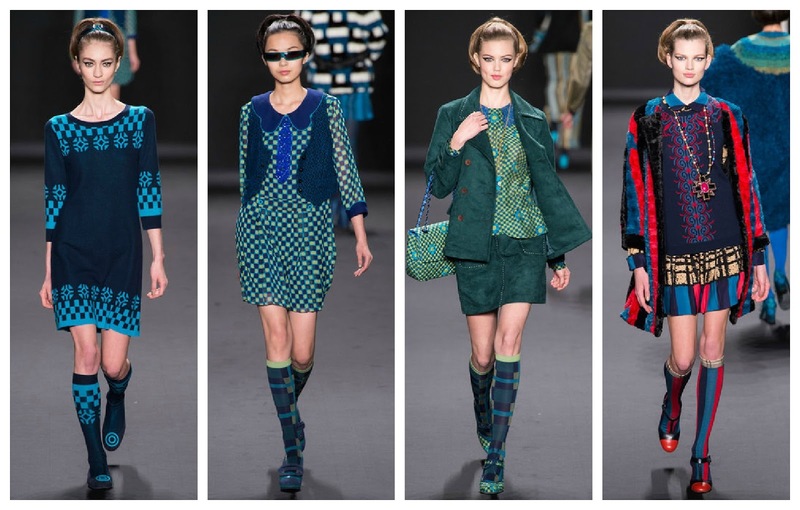 My other favorite is the 16th look which features a green and black geometric print, green patterned tights, green heels, and a bold necklace. 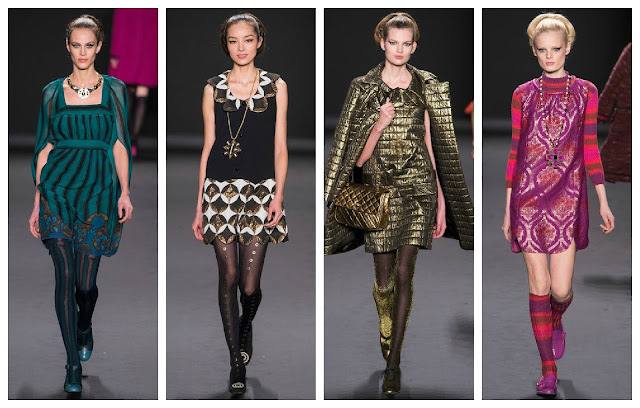 I like how color wise the tights match the dress, but there is a contrast with the prints which works nicely. This one has a definite 1960s vibe verging on a little costumey, but more like you stumbled upon someone's great vintage wardrobe. To tone down the print and color a bit, try pairing it with solid black tights, a black jacket and possibly black shoes, though the green ones would still be a nice color pop against the black tights. 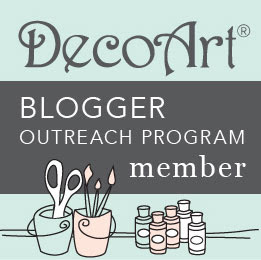 Since it is such a busy pattern, you could exclude the necklace. Overall this collection is very nice, but if it's too bold for you, there are a few ways you could tone down the styling of the pieces. For a runway show, you want to show the full impact of the theme, though that might not be the way it would be worn normally. I've selected many pieces above to share with you, but to see the full runway show, watch this video.